Jemarl Baker confirmed the news of his transfer via a press release from UK on Wednesday. He is now in the NCAA’s transfer portal with no intentions of changing his mind to come back to Lexington. In the release announcing his departure, Baker said, “I want to thank the Big Blue Nation for supporting me during my two years at Kentucky. You are truly the best fans in the country and I’ve enjoyed my time here wearing the Blue and White. There are no restrictions on where Baker will land, although he will have to sit out a year per the NCAA’s transfer rules. If you were unable to catch the live version of Wednesday’s Kentucky Sports Radio radio show, you can now find it online via podcast. I encourage you to do so because we had two special guests in the house, Keldon Johnson and Tyler Herro, to discuss their time at Kentucky. — What feedback did the NBA give them that sealed the deal? — How much fun did they have in the Bahamas? — What went wrong in the Duke game and did it change their psyche? — What did they do in Lexington outside of basketball? — What happened against Auburn? — How often did Herro call himself a bucket? Kentucky’s Jemarl Baker is the newest name in the NCAA’s transfer portal. Friend of the program Evan Daniels broke the news via Twitter on Wednesday. Baker made big plays late in the year during the tournament run, but with Ashton Hagans and Immanuel Quickley coming back, plus incoming five-star guard Tyrese Maxey, it’s easy to understand why he would consider other options for his redshirt sophomore season. Baker averaged 2.3 points in 9.1 minutes per game in 2018-19, while shooting 31.0% from outside, which ranked fifth on the team. Good luck to Jemarl wherever he ends up. My guess is it’s somewhere out west so he can be closer to home. Keldon Johnson and Tyler Herro are about to embark on their signing tours across the Bluegrass. Here’s where you can meet them and wish them well in the NBA. Welcome back for another edition of Pilgrim’s Insider Notes, where we’ll be breaking down all of the chaos we’ve seen in the world of Kentucky basketball and recruiting over the last week or so. We’ve got some new graduate transfer options to take a close look at, NBA Draft decision updates, and a big announcement coming up on Friday. The most significant development we have over the last 24 hours is Kentucky’s interest in Virginia Tech graduate transfer Kerry Blackshear Jr. Reports surfaced late last night that the UK coaching staff had serious interest in the Hokie power forward, with KSR confirming those reports. Blackshear, a 6-foot-10 junior out of Orlando, FL, averaged 15 points, 7.5 rebounds, and 2.4 assists for Virginia Tech last season. He also finished in double figures in 28 of his 35 total games, including nine double-doubles on the year. Two of his biggest performances actually came against Duke, when the Hokie forward finished with 23 points and ten rebounds in their regular season matchup, and 18 points and 16 rebounds in their NCAA Tournament matchup. While I don’t believe a commitment is imminent in the slightest, I can confirm that there is mutual interest and the expectation is that Kentucky will receive a visit. There is also a chance Blackshear tests the NBA Draft waters, though the expectation is that he will not receive the feedback he’s hoping for and will transfer elsewhere to play next season. This morning, Kyle Tucker of The Athletic tweeted that Blackshear’s father had not heard specifically from John Calipari or the Kentucky coaching staff, which may certainly be the case. The Virginia Tech forward only put his name in the transfer portal just a day ago, so we’re still extremely early in the process. That being said, sources tell KSR that Kentucky has absolutely sent out feelers to Blackshear’s camp and has let them know they are interested. That interest was returned. Outside of the Blackshear news, I reported last night that Kentucky also reached out to another prominent name on the transfer market. While I can’t reveal who that player is quite yet (it’s a name you guys would know), sources tell KSR that this would be in ADDITION to Blackshear joining the fold. When I am allowed to reveal the name, you guys will be the first to know. While I can’t say who the mystery transfer is quite yet, I can tell you that it is not VMI guard and Rupp Arena legend Bubba Parham. I talked with Bubba’s mother last night, and she said that while he would likely have interest in the Cats if the opportunity presented itself, Kentucky has not reached out yet. Parham is only a junior and will have to sit out a year no matter where he goes. While they certainly have respect for Parham’s game and believe he’s a solid player, Kentucky isn’t certain what the guard rotation will look like a year from now. They feel very confident about their position with several elite backcourt prospects in the class of 2020, and using another scholarship in this situation would be a bit of a risk. Blackshear is the name to watch out for in the immediate future, while the other player in question is expected to take a little bit longer before narrowing down schools officially and taking visits. Whenever that may be, Kentucky will be in the conversation. This morning, Kentucky forward Keldon Johnson announced he would be keeping his name in the NBA Draft, following in the footsteps of both Tyler Herro (yesterday) and PJ Washington (last week). When they both announced they were going to go through the process last week, they each specifically added in their press releases that they intended to keep their names in the draft if they liked the feedback they received. In fact, Johnson said specifically that he was hoping to become a lottery pick, giving fans some hope that he would slip outside that range and return to school for a sophomore season. Over the weekend, they spent their time communicating with NBA teams and figuring out what pick range they would likely be falling in. Herro said this morning on KSR that teams told him he would fall in the 10-25 range, while Johnson said teams said he had a great chance of landing in the lottery. They always wanted to leave for the NBA, and once they both got solid first round grades, it was a guarantee. As a reward, they went out and purchased an Audi RS 5 (Johnson) and a Maserati (Herro) and said goodbye to the Big Blue Nation. Now, the only players left to decide are EJ Montgomery, Nick Richards, and Jemarl Baker (transfer). While I do find it odd that we haven’t heard anything on those three quite yet, I do believe the most likely scenario is that all three return next year. I still think it’s possible one or both of Montgomery and Richards declare for the NBA Draft and see what they need to improve next year, but I just don’t anticipate them keeping it in there. As for a transfer, there have been rumblings about Montgomery looking at his options, but I don’t see him sitting out a year before playing elsewhere. He wants to get to the NBA as soon as possible, so I believe his two options right now are returning to school and improving with hopes of entering the draft next year, or taking a chance on himself and going the G-League league route. I like Kentucky’s chances of getting Richards back regardless. With Baker, I heard last week that transferring to be closer to home wasn’t on his radar and that he enjoyed Lexington, but the fact that we haven’t heard a definitive announcement as of yet makes me think he’s definitely keeping his options open. If the roster stays at it is in the backcourt and he feels he can carve out a role as the go-to shooter off the bench, I think there’s a decent chance he returns. If Kentucky adds another guard via reclassification or transfer and it looks like the playing time he’s hoping for won’t be available, then I think a transfer is on the table. According to several reports this afternoon, Baker has put his name in the transfer portal and will look to play basketball somewhere closer to home moving forward. He said on multiple occasions throughout the season that as a California native, he’s homesick, and that certainly played a big part in his decision. Like I said above, I have heard that he genuinely enjoyed his time in Lexington and would’ve loved to stick around if his role on the team was more clear/significant going into next season. With Ashton Hagans, Tyrese Maxey, and Immanuel Quickley all set to play significant minutes, along with Kentucky also being interested in five-star combo guard RJ Hampton for 2019 (or if another solid graduate transfer opportunity presented itself), Baker saw the writing on the wall for next season. Combine that with the distance factor, and it makes sense. Last week on the Insider Notes, I said that I felt pretty confident that Kentucky was out for 2019 five-star forward Matthew Hurt and that Duke was the likely landing spot. Then, Evan Daniels of 247 Sports came on KSR a few days later and said that while he felt good about the Blue Devils coming out on top, the Wildcats were likely No. 2 on his list and could make a push. I have to be honest, that threw me off a bit. Admittedly, Daniels is the best in the business and his track record proves that. For him to say Kentucky still had a shot was significant to me. After doing some more digging, I was told that Kentucky was working to put together one final visit before the decision and that they felt they could make up some ground. That visit did come together and was scheduled for Sunday, but was eventually cancelled because Hurt’s father, Rich, said they couldn’t fit in visits from all the schools trying to get one last shot at talking to his son. Instead, Hurt shut down his recruitment and will be making a decision on Friday based on what he already knows about all schools involved. Some people have compared this situation to Kevin Knox’s recruitment a few years back. Knox was a quiet player and truly didn’t tell anyone where he was leaning, but analysts went with the buzz around Duke and North Carolina and assumed it was down to those two schools. The former five-star small forward shocked the world and chose Kentucky, telling people that no one had any idea where he was leaning and the rumors out there were false the entire time. With this situation, though, I don’t think we’ll see a similar situation play out. In fact, I’d be shocked if Hurt’s decision is anything other than Duke. I’m told that Kansas – a longtime leader for the five-star forward – does not believe they will be the choice. North Carolina has some confidence and there has been a bit of growing buzz about the Tar Heels, but that decision would shock me, as well. Daniels thinks Kentucky is sitting at No. 2, but without them getting that final visit on Sunday, I just don’t see them jumping the consensus favorite. I’m holding firm on my Duke pick. I will be flying out to Las Vegas tomorrow morning to see future Kentucky Wildcats Tyrese Maxey, Kahlil Whitney, and Keion Brooks Jr. in action at the Jordan Brand Classic. The big practice is scheduled for Friday morning, with Media Day festivities coming right after. If you have any questions you want me to ask them or specific recruiting updates you’re looking for while I’m out there, leave them in the comment section and I’ll make sure to get them addressed in the coming days. While you’re at it, give me a follow on Twitter at @JackPilgrimKSR and feel free to reach out to me there about whatever questions you may have. 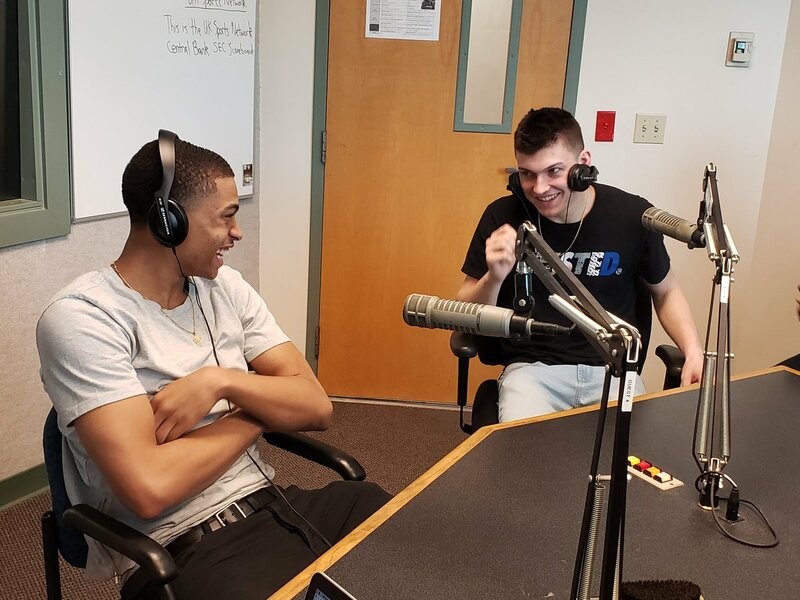 Keldon Johnson and Tyler Herro just wrapped up their appearance on Kentucky Sports Radio, and told Matt that even though they loved their time in Lexington, the information they received from the NBA made it impossible to pass on their dreams. Tyler wasn’t as highly ranked as Keldon coming in, so it wasn’t immediately certain he’d follow the one-and-done path; however, hours of hard work in the gym paid off, much like another four-star recruit that came to Kentucky. We’ll have the audio of their interviews up in just a bit. Keldon Johnson announced this morning he’s staying in the draft, meaning that his career at Kentucky is over. Let’s spend the time waiting for his interview on KSR looking back at some of his biggest moments as a Wildcat. It also became clear early on that Keldon is a goofball, which made him an easy target for his coaches. As you know, Kentucky would go on to lose this game, but that shot was insane. After somewhat of a slow start to SEC play, Keldon Johnson came alive in Kentucky’s win over No. 1 Tennessee at Rupp Arena, hitting three threes on his way to 19 points. With Reid Travis out with a sprained knee, Kentucky needed someone to step up on the boards, and Keldon did, snagging a career-high 17 rebounds, the most by a Wildcat in an SEC game under Calipari. As Cal said afterwards, Keldon told on himself with that effort on the glass. After a disappointing performance at Tennessee, Keldon bounced back in a big way at Ole Miss. With Reid Travis still out and PJ Washington in foul trouble early on, Keldon stepped up, scoring 14 points and pulling down five rebounds in the first half. He finished with 22 points, seven boards, and three assists, his first 20-plus point outing in a month and a half. With PJ Washington out, Keldon rose to the occasion in Kentucky’s first round game vs. Abilene Christian, scoring a team-high 25 points, including three threes. Keldon Johnson decided to keep his name in the NBA Draft, ending any possibility he will return to Kentucky for a sophomore season. On Wednesday of last week, Johnson announced he would enter the draft process, but said a final decision on his future had not yet been made. That has since changed as he announced this morning that he will remain in the draft and close the book on his college basketball career. BBN, it has been a dream come true to play in front of you. I will forever be indebted to you for your support. Go CATS now and forever!??? In Johnson’s one season at UK, he averaged 14.6 points and 5.7 rebounds, including a career-high 17 rebounds against Auburn in Rupp Arena in the regular season. He also was named SEC Freshman of the Year and was selected to the All-SEC Freshman Team and All-SEC Second Team. Most NBA mock draft projections have him slotted in the No. 18-22 pick range. Herro came to Lexington with intentions of shaking the generic “just a white kid who can shoot” label, and leaves as a versatile guard whose improvement on the defensive end is as impressive as anything he did with the ball in his hands. Herro’s time as a Wildcat gave us a breakout performance in Atlantis, 14 points per game during the season, a free throw streak that may never be matched, one of the better nicknames in the program’s history, a game-winner in the Sweet 16 and many, many more unforgettable memories. Tyler Herro loves to play the villain. When asked if he’d rather make a big shot at home or on the road, the Kentucky freshman didn’t hesitate. It was a pleasure watching the Bucket. Kerry Blackshear Jr. is a name to watch in the coming days. The former Virginia Tech big man announced he will leave Blacksburg as a graduate transfer for his final year of college basketball next season. Soon after he shared the news, ESPN ranked him as its top transfer on the market this spring. Blackshear will probably take a glance at Kentucky as a potential landing spot, and it’s easy to think John Calipari will entertain the idea of adding him as another weapon inside. In fact, a source told KSR the two sides have already been in contact with one another about bringing Blackshear in as a grad transfer next season. If the name Kerry Blackshear Jr. sounds familiar, it is because we have already seen him in Rupp Arena once before. He started for Virginia Tech when the Hokies gave Kentucky all it could handle in December of the 2017-18 season. Blackshear went for 18 points on 7-of-11 shooting with five rebounds in the 86-93 loss to the Cats. Maybe we will see more of him in Rupp Arena in 2019-20? Before you get too excited, you should know he also entered his name in the NBA Draft. He is considering all options for the next step in his basketball career. Now that Tyler Herro is off to the NBA, he is free to begin his post-UK basketball activities. That means an exit interview with Kentucky Sports Radio, which is all set for Wednesday morning’s show. Herro will join KSR in studio tomorrow to discuss his time at Kentucky and what’s ahead as he prepares for the league. We will ask about the highs and lows of his short career, what it means to be a bucket, and whatever else comes up along the way. Be sure to tune in. If you can’t, we’ll post the full interview as soon as we can tomorrow afternoon. Tyler Herro closed the door on returning to Kentucky for a sophomore season. He announced via his social media channels that he will remain in this year’s NBA Draft. “Thank you, BBN. 14 out,” he tweeted. “After exploring my options a little bit more and getting some immediate feedback, I’ve decided to remain in the draft. My hope was always to remain in the draft and begin my lifelong dream of playing in the NBA, but we wanted to be absolutely certain that taking that next step was in my best interests. After the information my family and I received, I believe that time is now and I’m ready to jump into that next stage of my life with both feet. “This year was everything I had hoped for and more. Coach Cal and the staff challenged me to become a complete basketball player, and I truly believe I’ve done that and improved in all areas of my game. I can’t wait to take what I’ve learned to the next level. Thanks for a fun year, Bucket. Just a year after Sacha Killeya-Jones announced he would transfer from Kentucky, the former McDonald’s All-American has joined a Central European basketball academy. Get Better Academy in the Czech Republic’s capital of Prague announced Killeya-Jones recently joined the program. Through his first nine games with the program he’s averaged 19 points and 8.7 rebounds per game. Before crossing the pond, SKJ spent some of the 2018 season with N.C. State. In February head coach Kevin Keatts announced the forward was no longer with the program. Best of luck to the former Wildcat in Prague.